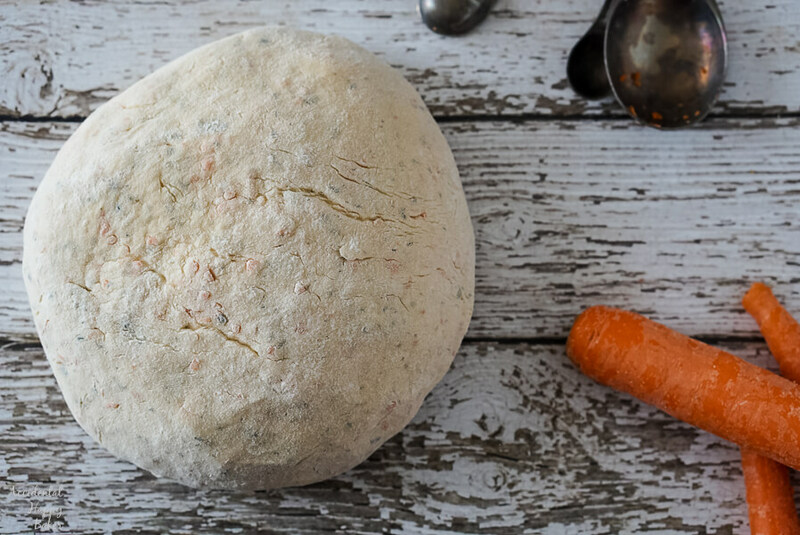 My homemade carrot and chive bread is hearty, rustic and speckled throughout with orange and green from the carrots and chives. 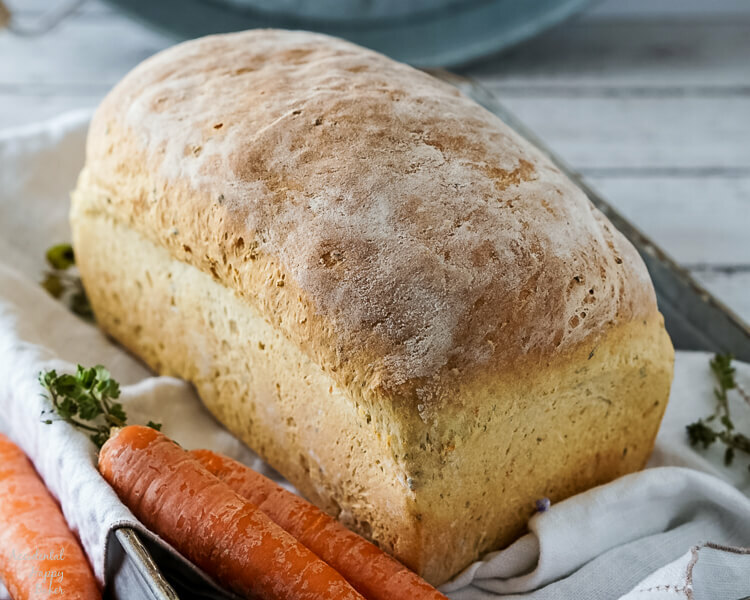 This country yeast bread smells amazing and will instantly make you think of warm summer days spent in the vegetable garden. I am so excited to share this recipe with you guys today! 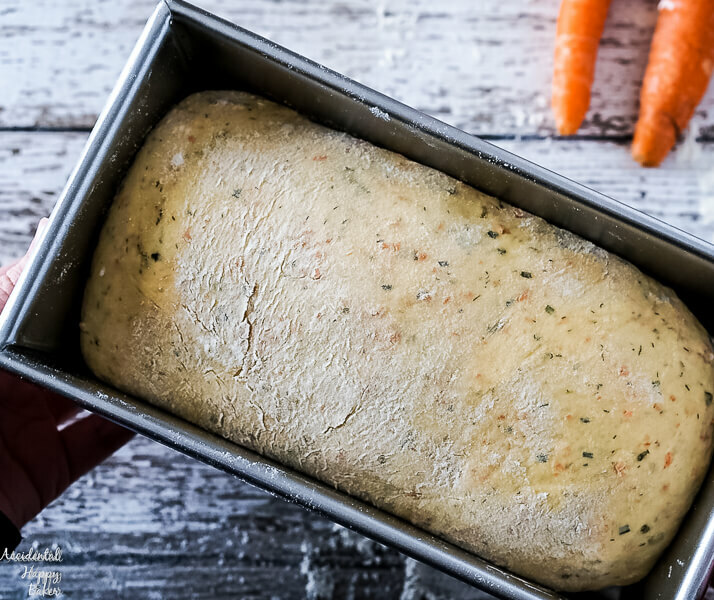 There’s nothing quite like the smell of fresh bread baking and this carrot and chive bread smells so gosh darn homey there’s just nothing quite like it. 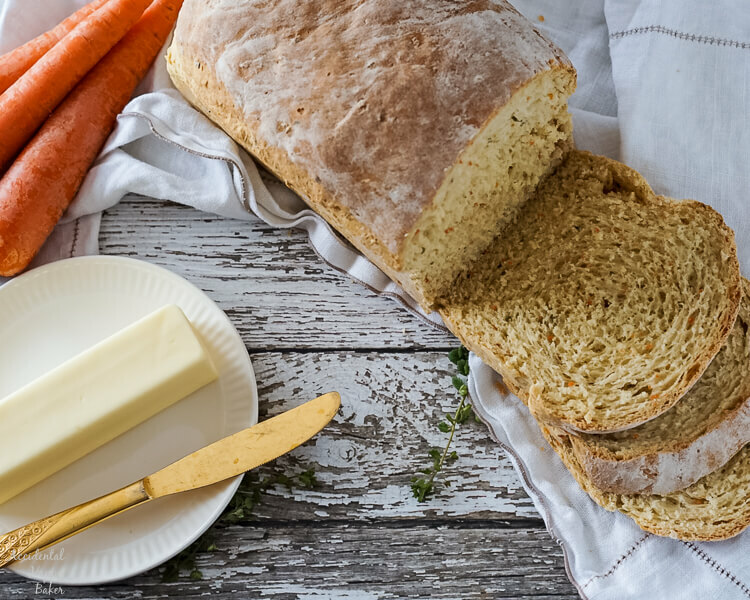 There aren’t a lot of recipes for carrot bread made with yeast or recipes for savory carrot bread. I know, I looked and when I came up empty handed, I decided to make my own. Something told me this flavor combination would be just right baked into homemade bread and boy was it! It’s perfect alongside a hearty meal or to use for sandwiches. And I know it’s not exciting, but heavens does it make great buttered toast. 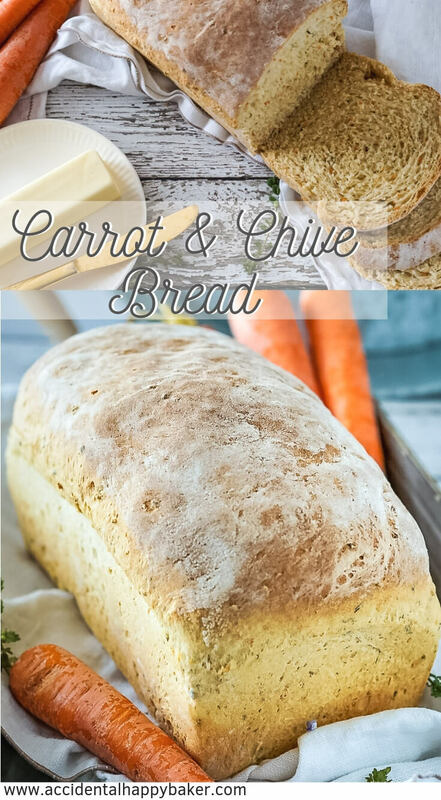 This carrot and chive bread starts with shredded carrots. I like to take the little matchstick carrots you can buy in the store and whiz them in the food processor, because the grater attachment on my food processor broke. Next you’ll add dried buttermilk powder, sugar, salt, dill weed, chives, instant yeast, and melted butter to your mixing bowl. Because we are working with yeast, we’ll need 1 ¼ cups warm water, about 105 degrees. I really recommend buying an instant read thermometer for making bread, it cuts out pretty much all the guesswork that often comes along with baking bread. It’s been a game changer for me. Add 1 ½ cups of all purpose flour and mix well with your mixer until the flour is combined. At this point the mixture should be very wet, but thick. If you have a stand mixer switch the attachment to the dough hook and if you don’t, switch to stirring in the flour by hand until the dough forms a ball that can be kneaded. Add 1 ½ cups of bread flour and knead for 5-7 minutes until the dough becomes smooth and elastic. You may need to add up to another ¼ cup of flour depending on the moisture content of your carrots. Place the bread dough in an lightly oiled bowl and cover. Let it rise for 45 minutes or until doubled. 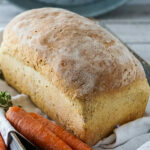 Punch the dough down and shape into a loaf, this time placing the dough into a 8×4 inch loaf pan for the second rise and allowing it to rise one more time for approximately 40 minutes. About 20 minutes before the dough has finished rising, preheat the oven to 375. Then bake at 375 for 35-40 minutes or until the center of the loaf has reached 190 degrees fahrenheit. 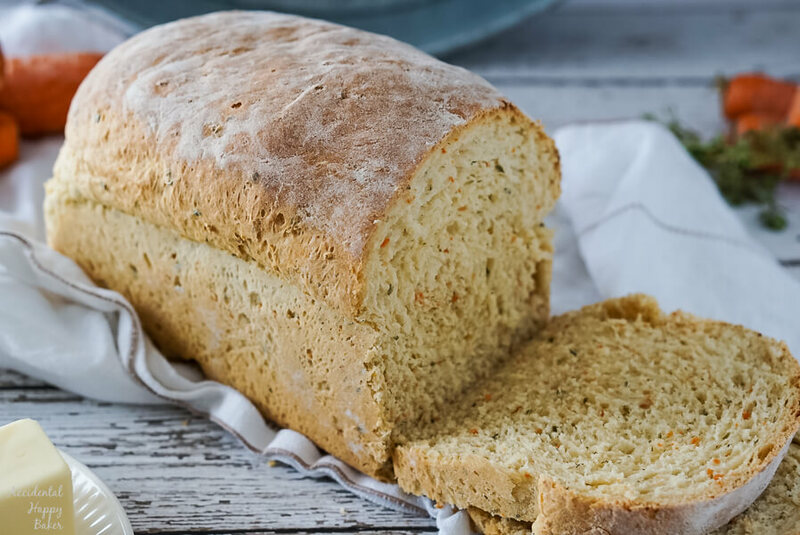 Carrot and chive bread is hearty, rustic and speckled throughout with orange and green! In a large mixing bowl, add the shredded carrots, buttermilk powder, chives, sugar, salt, dillweed, yeast and butter. Add the warm water (105 degrees) and the all purpose flour and mix on low for 2-3 minutes. If you are using a stand mixer, change to the dough hook. If you are using a hand mixer, stir in by hand the remaining bread flour. Knead the dough for 5-7 minutes or until the dough becomes smooth and elastic. 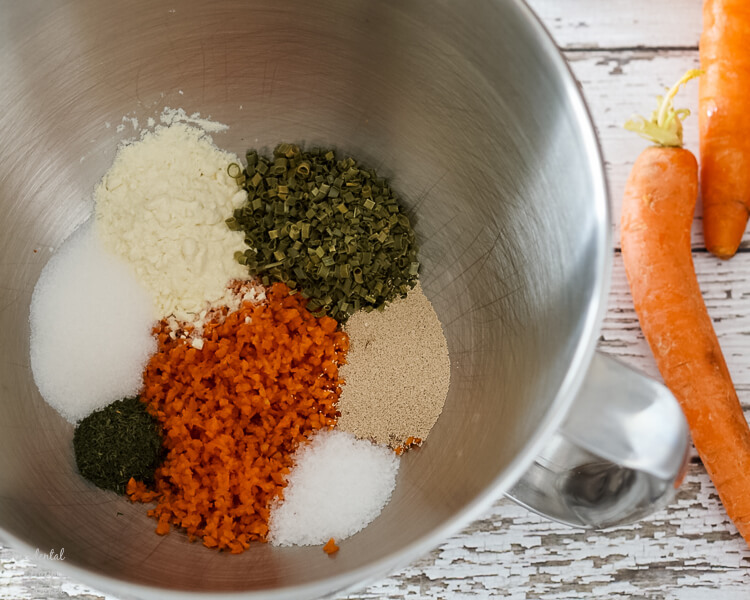 You may need to add up to a 1/4 cup more flour depending on the moisture content of your carrots. Only add enough flour to keep the dough from sticking as you knead. Place the dough into a lightly oiled bowl and turn to coat. Cover the bowl with plastic wrap and place in a warm draft free area to rise for 35-40 minutes or until doubled. When the dough has doubled in size, gently punch the dough down to remove the air bubbles and shape into a loaf. Place into a standard 8.5 x 4.5 inch bread loaf pan. Cover lightly with a tea towel and place in a warm draft free area to rise for another 35-40 minutes. About 20 minutes before the end of your rise time, preheat the oven to 375 degrees. When the dough has risen about 3/4 of an inch above the edge of the pan, place on the center rack of the oven to bake. Bake for 35-40 minutes or until golden brown on the top. The loaf should sound hollow when thumped and have an internal temperature of 190 degrees. Remove the bread from the oven, and turn it out of the pan onto a wire rack to cool. If desired, rub the crust with a stick of butter; this will yield a soft, flavorful crust. Cool completely before slicing. Store the bread in a plastic bag at room temperature.